The tragedy of Prince of Persia: The Sands of Time's ending -- spoiler warning on this paragraph for Jake Rodkin and others -- is that while the Prince has saved the life of his new love Farah by rewinding time, she has now never met him. The Prince remembers their relationship, and still loves her, but they can no longer be together. The irony of the ending is that soon the Prince will forget all this too, as will the audience. In 2008 the slate was wiped clean and the Prince and the Princess met anew and fell in love for what is now the third time. Their story, once patterned after the fables of One Thousand and One Nights, has become Eternal Sunshine of the Spotless Mind. After only two games, not including a DS card-based spinoff and a baffling array of repackaged PSP and Wii versions, Prince of Persia needed a reboot. Maybe audiences viewed the series as inaccessible or irrelevant; thought of its history as baggage. The new (and conservatively-titled) Prince of Persia erased from its legacy all but platforms, a sword, magic, a girl and a guy who doesn't seem either princely or Persian but does appear on the cover. The series has taken the drastic step of resetting its entire history, shortly after it reset its entire history in 2003. Sands of Time quietly called itself a prequel, not a reboot, probably because the film Casino Royale hadn't yet been made, and Ubisoft overestimated the audience's protectiveness of Prince of Persia continuity. Before Casino Royale, James Bond had worn out his welcome. The secret agent himself was an old, larger-than-life caricature and the films were creatively stagnant. Even though Bond's love interests and physical appearance were reset all the time, those changes alone couldn't halt the series' gradual decline. If anyone was going to take James Bond seriously again, there would have to be a clean break from a 40-year, 20-movie quagmire of gadgets and supervillains, and it would have to start all over. It took Prince of Persia three games to get to that point. 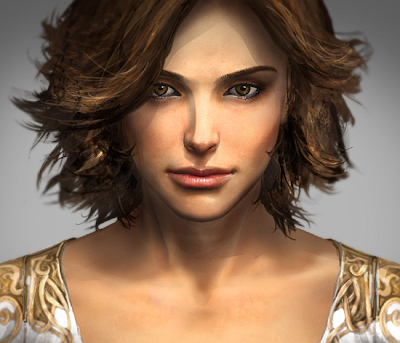 It's been pretty easy to fall out of love with Prince of Persia. It was great in 1989 and then never again until Sands of Time, which had unequivocally divorced itself from the preceding three games and from the clunky misfire Prince of Persia 3D in particular. To broaden its appeal, the roles were recast, the story was retold, and it regained the attractive simplicity the series had lost after 1989. It made itself young again. (Star Wars: Knights of the Old Republic, released the same year, pulled off the same trick, but because it's not quite so permissible to "reboot" Star Wars, placed its events 4,000 years before the movies.) A year later, the series discovered a new nadir in Warrior Within, prompting another rethink. After two promising starts, Prince of Persia sank each time until someone came along with a crane to haul its corpse out of a tar pit. Prince of Persia has never ended well, and so Ubisoft brings it back to the beginning. That was where the potential was, and it's the only way anyone will care again. Where does Prince of Persia keep going wrong, and is it doomed to be eternally reinvented? 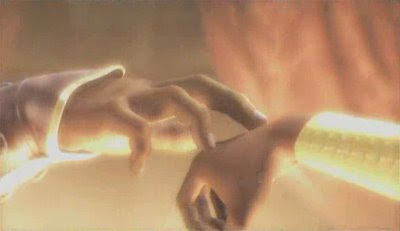 Prince of Persia began with, and has twice returned to, a fairy tale in the style of Aladdin and the magic lamp. A noble prince overcomes an evil vizier to rescue a beautiful princess. That's the origin of its narrow fiction. 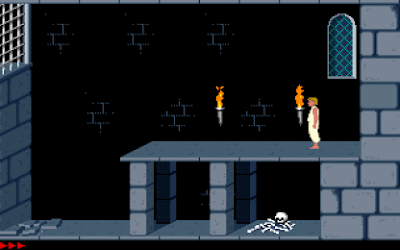 The initial game mechanics have attained a similar timelessness within the video gaming canon: the 1989 game directly communicates objectives (the princess, level exits) and obstacles (traps, monsters) to the player in an unencumbered language less and less possible with each successive gameplay generation. It offered the template for a genre just as simple parabolic fairy tales and myths have inspired later fiction. The recent games haven't been comfortable with their predecessors' ordinary elegance. In Warrior Within and Two Thrones, we see an affected "adult", "sophisticated" take on the fairy tale and Prince of Persia '08 updates the fiction for modern audiences via a sassy hero. Out of the series' two completed trilogies, the first game in each still stands as the best. It's proven difficult to improve on a classic, but not so hard to wave all the progress away and pretend none of it ever happened. This is the franchise that can't grow up. From the beginning, Prince of Persia was at heart romantic, idealistic and nostalgic for the 10th century, or for being ten years old and reading about viziers, djinn and young heroes. It was never meant to grow up. Sands of Time delivered with a slight relationship story about a boy and a girl in a world of magic, and with its colourful visuals, Prince of Persia '08 embraces that style halfheartedly, reserving the right to snark about it. The game pledges that there's more to come, but is the new trilogy already off to an unsteady start? Historically, it's all downhill from here. This Prince is off on a great adventure, but maybe he has less time than he thinks. The Prince may be cursed to run through that dungeon chasing the same girl for the rest of his life, every five years forgetting the way out. But it's alright. That's where he's loved. Prince of Persia is the new Final Fantasy, then? Every game is a reboot. Pity, since I liked the Sands so much. But if it is true that each iteration a series going downhill, I can't see this new trilogy lasting. I remember enjoying Prince of Persia 2: The Shadow and the Flame. It's probably the closest thing the series has had to a proper sequel. Timothy Dalton was the reboot for Bond (grittier feel, more in line with contemporary culture -- 80s) before they fell back into the schlock of old, before they rebooted again in Casino Royale. Does The Living Daylights count as a reboot in the same sense as Casino Royale does? Stylistically, it's an obvious change of direction but wasn't it still in continuity (as much as those movies ever had continuity.) Semantics, I know. Let's debate video game versus videogame again. I did think Prince of Persia 2 was alright, although lacking the cohesion of the original and was often really obtuse. Not actively bad by any means, though. Well, the big difference with "Casino Royale" was that "The Living Daylights" wasn't presented as a 'reboot' at the time, simply because that wasn't cool then (no "Batman Returns"!!) - but for most intents and purposes it was a reboot (that was the producers' intention, I mean). I've never played any PoP, so I'll leave it at that. I think these two franchises moved in opposite directions; while the FF series were almost completely independent and literal 'reboots', only after FF10 did Square-Enix start recycling scenarios, worlds, towns and characters (specifically FF10-2). PoP on the other hand, is more a la Links and Zelda, where pretty much the same story is retold with a different accent (accent being platform, gameplay, graphics, Wii controller, etc). If anything, it seems I've either outgrown or become too critical of both, FF characters have become too androgynous, and instead of Final Fantasy, the games should now be called Final Steampunk, the genre has changed too much. PoP took a turn for the bad side (IMHO), they took a flawed, yet believable character and turned him into today's version of a "cool" California surfer, where he has to say a witty one-liner every 17 seconds. I think you hit the nail on the head: Prince of Persia sequals fail because they forget to KISS (Keep It Simple, Stupid for young'uns). I haven't played the latest game, but everything I have seen and heard about it really doesn't appeal to me.